This book by the popular author of Air Aces and Billy Bishop: Canadian Hero explores the role of the Allied bomber command during World War II. Did the Allied bombing of Germany in World War Two needlessly brutalize and decimate a terrified civilian population? Or was it necessary to force the end of the most destructive conflict in history? Dan McCaffery seeks answers to these questions on both sides of the bombsights. The importance of the bomber command to the Allied victory has always been hotly debated. 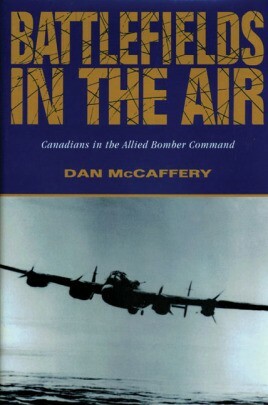 In Battlefields in the Air, McCaffery sets out to examine the role that bomber command played and to decide if Arthur Harris's strategy of area bombing was central or incidental to the Allied victory. Beginning with the Allies' early losses, the author describes how their position improved dramatically under the leadership of Harris. He discusses the bombing of the Ruhr dams, the raids on Hamburg, Berlin, Nuremberg, and Dresden, and he looks at the devastating effect that these campaigns had on the Germans. Relying on a wide range of sources, including interviews with Allied pilots and eyewitness civilian accounts, Battlefields in the Air offers a fascinating look at a dramatic chapter in World War Two.